Today’s sourcing and procurement function has the ability to be so much more than just the buying arm of the enterprise, focused only on getting the lowest cost. Shifting the focus to what the business needs to accomplish its goals can enable procurement to take into account elements such as supplier quality and reliability. 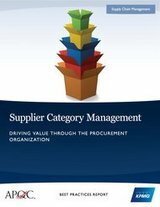 By emphasizing efforts in categories that are critical to the business, the procurement and sourcing organization can build and manage supplier relationships that deliver results for the business. Merck was among three best-practice organizations studied in APQC’s Collaborative Benchmarking study Supplier Category Management: Driving Value Through the Procurement Organization. This case study provides a comprehensive overview of how a recent merger has led Merck to reorganize its procurement group into centers of expertise with a more global focus.